Wirral Council’s Coordinating Committee (which comprises fifteen councillors, two parent governor representatives, a Catholic rep, is required to have an Anglican rep but at this stage I don’t really know why there isn’t one), met on the evening of 2nd October to reconsider the Cabinet decision of 4th September 2014 which made a decision to consult on closure after the “consultation” earlier this year. Neither of the two parent governor representatives (who have speaking and voting rights) nor the Catholic representative (who also has speaking and voting rights) were present. According to correspondence received hours before the meeting, a senior Wirral Council officer stated they have previously tried to persuade the Church of England to appoint an Anglican representative, but have failed and refers to this as merely an “anomaly”. So to summarise, that is eight people on the committee and seven deputies substituting for people who are on the committee but chose to send a deputy in their place for reasons best known to themselves. Ultimately the decision taken at the end of a long meeting (there were a series of votes at the end on whether to uphold the decision or refer it back to Cabinet to reconsider based on concerns councillors had) was to uphold the Cabinet decision of the 4th September 2014. This was taken on a majority of 9 votes to 6. Each of the alternative recommendations failed on a vote of 6 to 9. The alternative recommendations which were lost were proposed by by Cllr Phil Gilchrist (Lib Dem spokesperson) and Cllr Steve Williams (Conservative councillor). Labour councillors (9) voted to uphold the Labour Cabinet decision. The joint votes (6) of the Conservative councillors (5) and Liberal Democrat spokesperson (1) voted against Labour’s recommendation. Although six councillors were in favour of not implementing the Cabinet decision of 4th September and referring it back to Cabinet with their concerns, they were outvoted by the nine Labour councillors who voted against. This means the Director of Childrens Services, Julia Hassall can now go ahead to the next stage of closing the Lyndale School which is a short consultation (lasting about a month). Even if Wirral Council were taken to court over this matter, Surjit Tour made it quite clear in a formal letter to me that they would not pause the process and would just carry on doing this, regardless of many outstanding legal concerns. In the interests of transparency at this point, I refer to the exchange of letters between myself (mainly the one of 8th September 2014) and Surjit Tour in this matter about the possibility of legal action through the courts. He is of course entitled to his opinion on this matter, so am I. He has to work within the policy and budget framework of Wirral Council and is in a politically restricted post, I have to consider other concerns such as financial, legal, political and commercial (it’s complicated basically). Following this consultation Wirral Council’s Cabinet will make a further decision at some future point on closure of the Lyndale School. 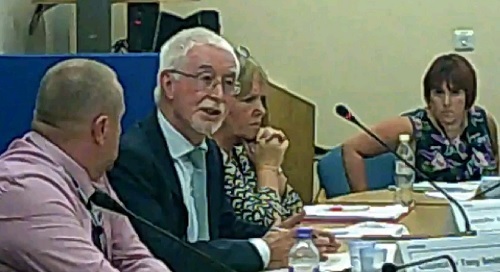 As it was such a long meeting and negotiations over potential access to Wirral Council’s wi-fi network for live broadcast of meetings as they happen have stalled, only part of the footage of the five-hour meeting at the time of writing has been uploaded. You can watch video of part of the meeting below. On a more personal note and this is just my opinion, I would like to point out (briefly) that politics comprises objective and subjective tests that can be applied when determining decisions. Nobody expects politicians to be experts as they are there to represent the public interest. In certain areas such as law and other areas they have to rely on the internal advice of Wirral Council officers. That is why officers giving advice are in politically restricted posts and can’t really be seen to be taking sides in a party political matter. Although it would be unlawful to drop Lyndale School’s budget by more than 1.5% under the minimum funding guarantee regulations this year (2014-15) compared to its 2013-14 budget, the government is currently consulting on draft regulations which would remove this current protection under the minimum funding guarantee for SEN places in 2015-16. However there is a current consultation on regulations which cover 2015-16 and the draft regulations put to Parliament may differ from those being consulted on. In fact you only have to look at how the regulations on filming meetings of Wirral Council changed after the consultation and lobbying by people such as myself to show that that is a distinct possibility. However how much Lyndale School receive this year for the education of children there and in future years is down to a complicated combination of the Wirral Schools Forum, Cabinet, Council and other factors beyond anybody’s reasonable control. A schools formula is arrived at locally by a combination of the Wirral Schools Forum, Cabinet and Council. This schools formula determines how much each individual school gets each year (and is changed each year). In essence though, this shouldn’t really be about money. The law allows Wirral Council to close a school, however naturally they have to plan for what happens next to the existing pupils. Some will transfer to secondary school well before the planned closure date of January 2016. This should really be about the children of Lyndale School. I will recite a little personal history here. My primary school was changed (when I was 10), not because of closure but because my parents had moved three miles away and transport to and from school was taking my mother longer than it was when I only lived a mile away. Therefore my perception of what happens to a primary aged child when you do this to them, is somewhat clouded by that. Twenty-four years later, I still resent that decision, as I do not feel my interests were properly considered especially considering the fact I would’ve left that primary school within the next twelve months to go to secondary school and that we had moved house many years previous. I can understand though that it resulted in a reduced carbon footprint as I could walk to the school I was transferred to. It ended up with me being admitted to hospital for a week though and knowing how much that costs makes it a false economy. The children of Lyndale School are more fragile than I was at aged ten. Wirral Council identify themselves in a Equality Impact Assessment that the disruption will have an effect on the children. However a letter from their legal department takes the contrary view that any potential risks can be mitigated against. Personally I have no confidence in Wirral Council that the potential risks have been mitigated at this stage, as my feeling is that such detailed planning won’t actually happen until a decision to close (or not close) the Lyndale School has been finally made at some future point. At this stage officers may consider behind the scenes that spending officer time and resources on planning for something that might not happen would not be value for money. However all scenarios should be explored if Wirral Council insists on going down this route. Considering the high costs already expended by Wirral Council on their plan to close Lyndale School, one wonders if that seemingly large and endless budget allocation had instead been used for keeping the Lyndale School open, whether it would’ve been a better use of public funds. Each time they hold a public meeting it costs thousands of pounds and there have been many of these so far. Such is the price of democracy I suppose which has deliberately made closing a school a long and drawn out process so that a “spanner can be put in the works” to stop it at any one of many stages. Some people are surprised it has not been stopped before now. However looking at the wider aspects of the way society treats disabled people, prejudice and other matters I am not wholly unsurprised by this course of events. Below is a playlist from when the meeting started. When the video was shown due to an outstanding unresolved copyright claim regarding one of the two pieces of music used in it by Sony Music Entertainment, the video has sadly had to be edited out of the footage of the meeting. However it can be viewed elsewhere online. « Isn’t it time Wirral Council got their sums right on Lyndale School? What a wonderful place that country is. My baggage is still in Kuala Lumpur but I won’t miss the Special Fudgit and Risk It Meeting on Wednesday 10 October if I have to go in the buff. I think it is now time for them to start fessing up John and it will be interesting to see who has the cojones to do it. Three years plus later…they are a joke… and not a funny one…better late than never. If they don’t I will be back annoying you and others on a daily basis ha ha. I really appreciate you taking the time to write comments I enjoy reading on my blog. Everyone has a family, including myself but I think you’ve already met Leonora. Australia is certainly different to the UK… as to “fessing up” as you put it, that’s not really for me to do on Wednesday. As you already know many of the officers involved are either no longer in the same posts or have left the employ of Wirral Council. At least Wirral Council didn’t have you arrested the moment you got off the plane, I’m sure they could have thought of something. I think you’re testing me about the date of the meeting aren’t you? 10th October is a Friday btw, surely you mean the 8th? Do you think they might use jet lag as an excuse for lying to me, they certainly fell hook line and sinker for Stella Artois jet lagged or not? And, my dear fellow, are you suggesting they have hijacked my dirty undies en route. Was Stella at the golf you must have got one of the thousands of freebies? I remember jet lag, but imagine what it’s like to not be able to get to sleep till late or wake up till late in the morning. Rather like living with permanent jet lag, it’s called delayed sleep phase disorder. No, Wirral Council didn’t invite me to the golf. They did invite us both to the meeting at the Floral Pavilion for Cllr Steve Foulkes to be made Mayor. However the Mayor’s Office decided to completely ignore the fact we had tickets and wouldn’t put us in our assigned seats near the front, but many rows back instead, oh well! I suppose I should be grateful as I’ve only had tickets to the Mayor making twice. On one of those two occassions Simon Holbrook misunderstood and used the fact we were at a “public meeting” as grounds for my suspension from the party. No, I didn’t go to the golf. My media colleagues on the Echo and Globe got invited. New media doesn’t qualify for a media pass to the Open as this blog ain’t about golf (much!). All I got out of the golf was an email from Surjit Tour moaning at me for rocking the boat over publishing Mr. Burgess’ email to councillors.